Fiberglass is a double-edged sword. It’s an excellent building material because it’s strong and durable, plus it’s easy to mold into pretty much any shape. But fiberglass’ thin strands often cause skin irritation, vision issues, and breathing problems for humans that come into contact with it. How can we take advantage of fiberglass’ excellent structural properties without putting human health at risk? Why, robots of course! A team of researchers from MIT has invented a type of swarm robot builders they call Fiberbots that can weave sizable structures from the material, like robotic silkworms — no human contact necessary. The Fiberbots create fiberglass tubes around themselves, one layer at a time, climbing the inside of the tubes to create lengthy cylinders, according to a paper published Wednesday in the journal Science Robotics. Tubes spun by several Fiberbots could create structures as large as bridges or buildings. First, one of the bots combines fiberglass thread with resin, which it then winds around an inflated membrane surrounding its squat, cylindrical body. Once the Fiberbot completes a segment of tubing, it deflates the membrane and “climbs” the inside of the tube to start another segment, which overlaps the one that came before it. Layer by layer, it can curve the material, even fitting it together with tubes built by other Fiberbots. 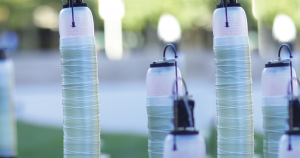 To put their system to the test, the MIT researchers directed the Fiberbots to build a series of 22 tubes stretching as high as 4.5 meters (14.7 feet), which took about 12 hours. The tubes stayed intact for seven months, withstanding the harsh conditions of a Massachusetts winter. We already use fiberglass for things like bridges, house insulation, and many different products. But in truth, that could be only the beginning. We could one day use Fiberbots to create the tubes we need for construction projects without requiring human workers to handle the material, the researchers write. The bots could even build their structures in harsh or dangerous environments that humans simply shouldn’t or can’t access — including other planets. The post These Robots Weave Super Durable Fiberglass Structures So Humans Don’t Have To appeared first on Futurism.